Man, she is really living it up this summer!! We both survived yet another salivagram and no one got hurt! ;) Marissa once again surprised me. First, they squirted the dye in her mouth and she didn't gag once! I had our trusty "chuck bucket" handy just in case she threw up, but she didn't need it. Hooray! And she stayed almost perfectly still for the hour and 10 minute test. Almost. 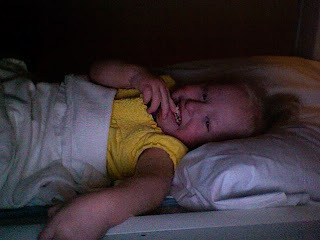 She did get a little restless at the end, but, for the most part, she was content to lay and watch her Signing Time videos. Thank you again Grandma Utah, those have been a true life saver on more than one occasion!! And they are thoroughly educational as well as entertaining! She's even smiling in this one, crazy girl! I got a little annoyed at the tech just before we got the go ahead to leave. Now, I knew going into this test that there was a potential we would need to come back later for a delayed picture if the dye had not moved enough during the first hour. The tech told me he was going to show the results to the doc there in the clinic and we might need to come back for a delayed picture. I said "Oh, I hope not". You wanna know what this guy asked me next? REALLY?? ARE YOU SERIOUS WITH THAT QUESTION?? DUH!! Despite the number of times we've been here and the amount of hours we have spent in this building having so many numerous procedures and tests done, we DO NOT like spending time here! You might like it because you get paid to be here, but THINK ABOUT IT MAN!!! We just want to go home and never come back!! HELLO!!! This is what I wanted to say to him, but I was polite and did not. I just said "well, we just don't want to come back and do this again, that's all". Ugh. I know I am not above saying stupid things, but come on. I wanted to pull a Bill Engvall and say "here's your sign"! So, the good news is that we DON'T have to go back there today for a delayed picture and he said the doctor at the clinic said it does not look like she is aspirating on her saliva. He said we would need to consult with her pulmo in a few days to be sure, but for now, I'll take his answer. Thanks for your good thoughts and prayers! Marissa had not seen her cousins for nearly two years, so it was about time for them to get together again. All three girls had a blast playing together. Autumn and Amber were also very nice and gave Marissa a huge box (and then some) of their old toys. Very cool, thanks guys! Marissa has really come a long way with her "stranger danger" in the last several months. But for some reason, she still acts a little skittish around some people like my step-dad, my brother Brian and, as we found out yesterday, my brother David. By the end of their visit though, David was graced with a pat on the leg from Marissa, so some progress was made! Yeah, he doesn't look quite right to me, I'm outta here! Even though it is later, I'm still not feeling too friendly toward this guy they keep calling "Uncle Dave"
Yeah, not so much, I'm outta here again! SEE?? I TOLD YOU HE WAS NOT RIGHT!!! 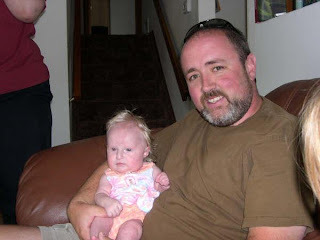 Too bad Rissa did not remember this visit from almost two years ago when Uncle Dave was a good guy! On a side note, please pray for Marissa and I today. She is going to have a salivagram which will test to see if she is aspirating on her saliva. I don't believe she is but her pulmo doc wants to make sure. This test is VERY tedious and difficult mainly because Marissa is supposed to lay as still as she can for at least an hour with no sedation. Yeah right, she is TWO!! She had this same test done last year and I posted about it here. Click on the link if you want to learn more about the procedure and why she has had it done before. I am going to wake her up early with the hope that she may be tired enough by 10:30 when the procedure starts that she will take a nap. I am also going to bring the laptop and her Signing Time videos (which she is absolutely completely obsessed with!) to keep her occupied if she will not fall asleep. Needless to say, I am dreading this as much as I did last year and I really hope she surprises me like she did last year and just falls asleep. I'll let you know how things went when I get the chance. And I would like to solicit some medical advice for myself real quick. I have developed an allergic reaction of some sort around my right eye. Don't know what caused it, but the skin around my eye is red, swollen, itchy and irritated. I slept all night with cortizone slathered all over it, but it did not seem to do any good. Good thing is my actual eye is not affected, just the skin around it. Does anyone have any suggestions for a remedy for me? Just had to show you all the right way, that's all! 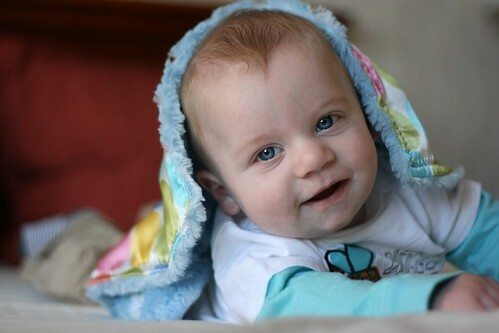 Once again, I ask for your prayers for this precious little guy. Since he was discharged from Boston Children's Hospital a couple of months ago, he has been on medication to keep his SVT at bay. It has mostly worked, until recently. Stellan's doctors and family have done everything they can and have taken his dose of this medicine as high as they can and now it seems to not be working at all. If you remember, he will need another ablation at some point in his life and most likely will need a pacemaker at that time as well. But his doctors are needing him to be at least 40 lbs, which would be when he is about 4. At only almost 8 months old, he has a long way to go before he is big enough. Unfortunately, the doctors and his family are quickly running out of options as there are not many more medications they can put him on that will keep his SVT away. He was just admitted to the PICU at his local Children's Hospital this afternoon. The doctors and the family have some very big, very scary decisions to make on how to make Stellan's sick little heart well. Thankfully, Marissa's heart condition is relatively minor (as minor as a heart condition can be) and was fixed with a routine surgery when she was three weeks old. Her heart continues to do well and has proven to this day to be the least of her medical issues. But, for the first three weeks of her life, it was the biggest of her problems and we were afraid we might lose her because of her sick heart. I can tell you firsthand what this Mama and the rest of Stellan's loved ones are going through at this very moment. It is one of the most sickening and heartbreaking feelings on the planet to sit by your child's bed and pray for a miracle to keep them alive. Please love on this baby boy and his family by lifting them up in prayer tonight. Please pray that God wraps His loving arms around Stellan, his family, and his doctors at this time. Please pray for guidance as to how to proceed with his future care. ... regarding this previous post. I was in e-mail contact with Marissa's ENT last week. I raised my concerns to her and sent a video to document part of what Jeremy and I are noticing with Marissa's breathing. I am going to copy and paste my e-mail to Dr. P and her response back to me to let you all in on what we are concerned about. 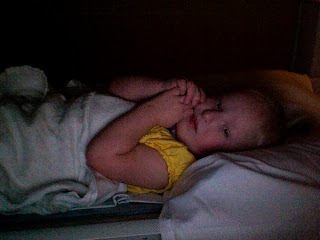 I would like to share with you some concerns I have regarding my daughter's, Marissa, airway. We are noticing a loud squeak when Marissa is inhaling when she is agitated (laying on her back, not capped or anything else on her trach) She gets really agitated when it is bedtime and she is told to lay down (like any other toddler). This is the scenario the video captures. We started noticing this around the beginning of the year and just chalked it up to her swollen tonsils. Even though logic would tell us that her breath would go the path of least resistance and if she was having trouble breathing past the trach tube and past her swollen tonsils she would just breathe in and out of her trach. We had the T & A done and while she was recovering, for about the first month, we did not hear the squeak. Then we started hearing it a little bit. And then we downsized her trach and we started hearing it a little more. I do think she has handled the downsize well and I don't think that is causing the issue, simply because we had been noticing this before the downsize. In the past, we were in the habit of not turning the pulse-ox on until after she fell asleep because, when she would kick her legs, it would stop picking up and would false alarm. We recently decided to turn it on while she was agitated and squeaking and her sats go down to 88, 87, 86, as you can see in the video. As soon as she calms down (which she does realatively quickly) her sats go right back up to 94 - 97. We can tell the pulse-ox machine is getting a pretty good signal. The squeak sounds EXACTLY like the stridor she had in the NICU before she got the trach. We feel her tongue is possibly still occluding her airway in these instances. Also, with the cap on her trach, she still works to breathe when she is playing vigorously. She wheezes, for lack of a better word. It mainly sounds like she has to work harder to inhale air past the trach tube itself. She also has the same squeak when she cries with the cap on. Most of the time, we will take the cap off to let her cry because she just can't get enough air. I have some friends whose kids have trachs and some of them who are capping say that their kids do work to breathe a little more, but there is no squeak. So, my other question is, could her trachea be collapsing somewhere and it has been missed by the bronchoscopies because it only happens when she is alert and agitated? Or, is this just a symptom of being capped and still having to breathe around the tube in her throat? Is there a scope that can be done in your office, without anesthesia, that could get a better picture of what is going on when this happens? She has been downsized for three weeks and she wears the cap all of her waking hours, just like she did with the PMV. She does well capped, except like I said, when she cries. We have an appointment to see you on July 7. Please let me know your thoughts on this and if you would like to see Marissa sooner. I’m not sure I can completely explain her squeak. It doesn’t sound completely consistent with upper airway (i.e. her base of tongue); at least over the video. If the squeak happens while she is awake, upright, and capped that also would tend to make me think it is not base of tongue because this collapse should be improved with positioning and level of alertness. It certainly could still be a component of tracheomalacia. The downside of my bronchoscope is it tends to give a more static picture secondary to the fact of the rigid tubing and general anesthestic required. The bronchoscope tends to “stent” the airway so I often don’t see a completely dynamic picture of collapse. The flexible bronchoscope, however, does give this type of picture. This is generally done by peds pulmonary (i.e. Dr. M) because his scopes are equipped to do this. My flexible scopes in the clinic (i.e. the ones we use to eval the larynx) are shorter and do not have the capacity for suctioning. Usually, when pulmonary does a flexible scope the patient will be under light sedation with anesthesia present. Because you are passing the scope through the vocal folds there is concern for possible laryngospasm. They also would need to perform this without her trach in to get a full dynamic picture (the trach also functions as a stent). I could take a look through her stoma (without the trach in place) with my scope, however, if we have a lot of secretions, I may not get a great picture (but we can certainly try). When you come in to see me we could give the flexible scope through the stoma a shot. I also would like to look (if she will tolerate it) from above (i.e. with the scope passed through her nasal cavity) to get a dynamic picture of her larynx and base of tongue while awake, agitated, and capped. So there you have it. There could be a possibility that tracheomalacia is still present. If this is the case, Marissa will obviously not be decannulated soon. More than that, I feel an overwhelming sense of disappointment that her issues may not be resolved like we thought they were. Still, I am trying to not put the proverbial cart before the horse. We still have to get her scoped by Dr. P and most likely Dr. M. We still have no true answers to these issues at this point. But, something is not right, that we do know. I will obviously be updating this thread as soon as we get some answers from our July 7th appointment. It turns out Mama was right about having a great time on our vacation. Aside from Major Puke Fest 2009 on the trip out to Grand Junction, and also while we stayed there, and peeing out of my diaper and soaking my car seat on the way home, it was a FUN FUN time!!! We saw Uncle Brian for the fist time in a LONG time! We ate (well, everyone else ate, I tasted) great food! I may be small, but I need my space. I like to spread out, that's all!! Sometimes, Daddy won't wake up, so he needs a little encouragement. This particular morning, a big poke in the eye did the trick!! Sliding down the slide was my absolute favorite! And, I got to "play" with the dogs. The puppy, Charlie, is the only one that I wanted to get near me. And even then, I didn't want her too close! And yes, Daddy was wearing his Army "cruit boots" with his shorts. His excuse for looking like a dork? "We are way out here in the sticks, no one can see me". Silly Daddy!! We had a blast but we are glad to be home. Now for some rest and relaxation before we get back to the grind. Vacation can be a lot of hard work sometimes! !